Melvin Van Peebles’ Sweet Sweetback’s Baadasssss Song is universally acknowledged as the film that sparked the Blaxploitation era in Hollywood. But Van Peebles—and his film—have a more complicated relationship with the films and the movement that followed in its wake. When Sweetback came out in 1971 “black films” were few and far between. In 1969, Warner Bros. had released Gordon Parks’ The Learning Tree and Ossie Davis directed Cotton Comes to Harlem that same year; Columbia Pictures brought out Van Peebles’s American debut, The Watermelon Man, the following year (his first feature was the 1967 French film La Permission [a k a Story of a Three-Day Pass]). These films, however, sprang from the prevailing Hollywood ethos of the day, their black stars and directors notwithstanding (though Watermelon Man showed traces of Van Peebles’s subversive nature, hinting at the cinematic explosion to come). Sweet Sweetback’s Baadasssss Song changed all that. Unable to find a studio to finance his 30-page ck script, Van Peebles decided to go it alone. With a budget of $500,000 and a cast and crew made up largely of black and Hispanic nonprofessionals, Van Peebles shot Sweetback guerrilla-style around L.A. over a 23-day period in May and June of 1970. 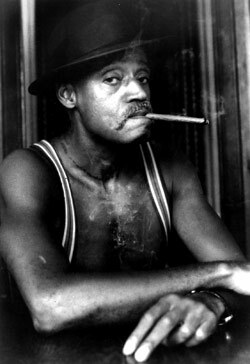 Yet despite the film’s low budget and the modest success of The Watermelon Man, Van Peebles could get no one to release his film. Finally, he found a struggling distribution company on the verge of bankruptcy, which agreed to Van Peebles’s demand for a 50% share once the movie grossed $5 million. The company, Cinemation, could only persuade two theaters to show the film: the Grand Circus in Detroit, where the film premiered on March 31, 1971, and the Coronet Theatre in Atlanta, where the film opened two days later. That would soon change. Black audiences and the Black Panthers weren’t the only ones taking note of the film’s success and power, however. As the film became a runaway hit (at its time, Sweet Sweetback’s Baadasssss Song was the highest-grossing independent film ever made), Hollywood came to a belated revelation: there’s an audience out there. When MGM released Shaft in July of 1971, and the film became a huge hit—propelled in large part by Isaac Hayes’s classic theme song—the floodgates were open. (Interestingly, Melvin Van Peebles contends that Shaft was originally written as a white detective story; that it was only changed following the success of Sweetback, a claim the film’s director, Gordon Parks, disputed in an interview with filmmakers Joe Angio and Michael Solomon during the filming of How to Eat Your Watermelon in White Company [and Enjoy It].) What followed was a torrent of black-themed studio films: Superfly…Coffy…Blacula…Black Caesar…and on and on and on. The Blaxploitation* era in Hollywood was in full effect. Later in the same documentary, Van Peebles’s son, Mario, elaborates on this point. “[Hollywood] made Shaft; they made Superfly. There was a chance for black actors to get work in leading-man roles. But there was also something else going on. What they did was they perverted the message. Bobby Rush, ex-Panther, Congressman Bobby Rush said to me, ‘One of the things your father’s film Sweet Sweetback’s Baadasssss Song did was it made being a revolutionary hip. And the Panthers made being a revolutionary hip. But Superfly made being a drug dealer hip.’ Big difference. By the end of the decade, the wellspring of black-themed films had reduced to a trickle, before drying up completely, and the Blaxploitation era in Hollywood died a silent, unceremonious death.